The Turkish supermarket on Camberwell New Road stocks lots of pickle varieties, labneh, a butchery and some good, ripe vegetables and fruit. Some of them are Turkish varieties that I haven’t seen before, such as the ‘flat beans’, also called ‘Romano beans’ I used to make this supper with my friend Zoe. They look a little like runner beans but are more tender and require less cooking and have lots of flavour. You could use green beans or runner beans instead. This dish was very simple to make and would also be good served cold and eaten with flatbread. 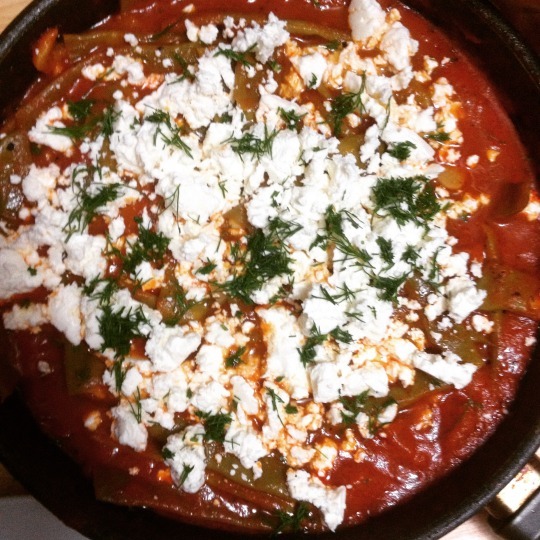 Feta is fine to use as cheese. Place all of the ingredients apart from the cheese and the vinegar in a pan with a good pinch of salt. Add in a tinful of water using the tomato tin. Simmer on a low/medium heat half covered with a lid for 20-30 minutes until the tomato is reduced by 1/3. Check that the beans are tender and stir in the vinegar. Simmer for another minute and taste for salt. Don’t add too much as the cheese is salty. Crumble over the cheese and serve with some chopped dill if you wish. Peel and cube a kohlrabi in to small chunks, stir in 2 tablespoons of thick yogurt with a good pinch of salt. Eat with crispbread or toasted bits of pitta. Add a tablespoon of olive oil to a pan and fry the chickpeas with ½ teaspoon of cumin and ½ teaspoon of cinnamon and a pinch of salt. Halved baby cucumber with dill and vinegar drizzled on. Cut the cucumber in 2, sprinkle on chopped dill and a small drizzle of wine vinegar. Season with a pinch of salt.